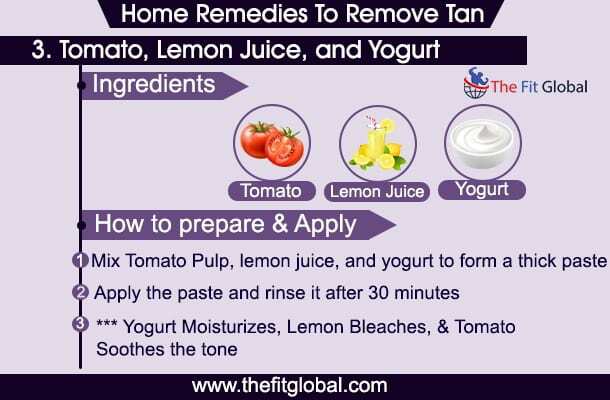 Here Are The Best 15 Natural Home Remedies To Remove Tan Permanently! 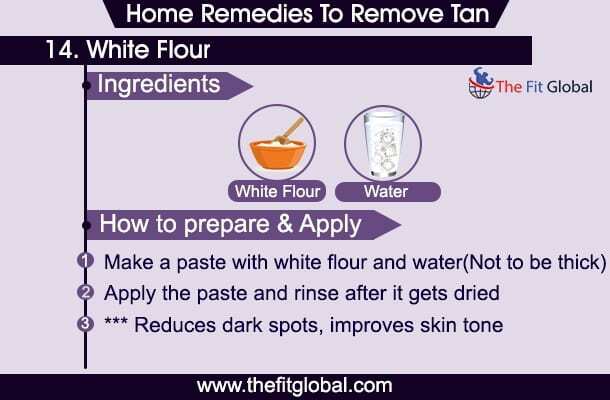 The best part about home remedies to remove tan is that there wouldn’t be any side effects when we apply them. During typical sunny days and in the seasons of spring and summer, we have this challenge of facing ‘SUN’ with high difficulty. When the sun shines the brightest, it’s the time to sit inside the home. Even a little exposure to the sun in hot weather will leave your skin burnt and causes a significant damage. Summer is the time of the year when you find escape in short dresses, miniskirts, sleeveless tops and gun jeeps, but the harsh sun leaves no stone unturned in ruining all your plans. Here is when the homemade face masks come to rescue. The strive for tan removal is not a fight for beauty. The skin with dead cells after undergoing a severe tan will nowhere find life if they are ignored. 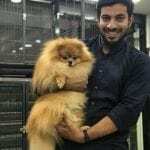 If the tan is not removed in starting days of your exposure to sun, it will show an irreversible impact on the skin as becoming robust and inelastic. Not just about turning dark or dull looking, the skin cells lose life towards becoming permanently insensitive, which is the major criteria for all this representation of remedies for tan removal. The tan will tend to become the skin’s texture after long time exposure to sun which is the uglier part of tanning. But the intention behind tan removal treatment is not for beauty and nor do we suggest all the below remedies solely for the enhancement of your appearance. Instead of going from salon to salon, taking super expensive skin treatments and investing in expensive cosmetics, apply these homemade face masks and you will get a shiny, fairer and smooth skin. Take a look at the best face packs for removing sun tan. Aloe Vera is packed with benefits as far as skin’s use is concerned. 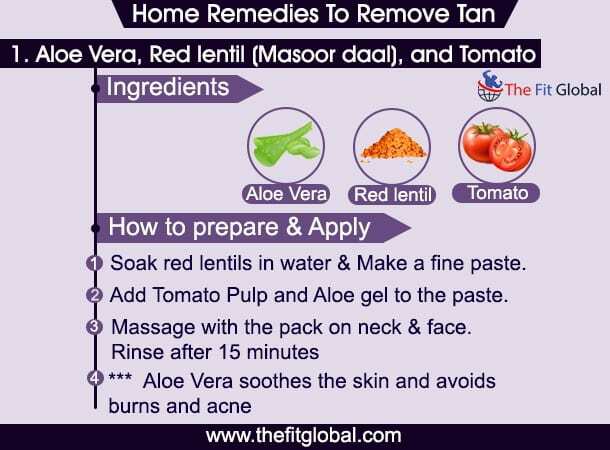 Tomato rejuvenates the skin and red lentil works magically to remove sun tan. Mix all the three ingredients and you get the best tan removal face pack. Soak the red lentils for about 15 minutes and grind to make a fine paste. Add tomato pulp and aloe vera gel to the paste. Massage on face and neck and wash off with plain water after 15 minutes. The lemon and cucumber make a great face pack in tan removal treatment. The popular Vitamin C in lemon juice adds excellent bleaching properties to the mixture which help in the lightening of the skin by the act of detoxification. It also reverses the damages caused by free radicals on the skin. It helps to remove age spots, dark spots and lighten the skin tone. Rose water and cucumber are the cooling agents that soothe the skin. Lemon gives an effective detoxification to skin. Cucumber and rose water soothe the sensitivity of the skin by cleansing action. To make this suntan remover pack take one tablespoon of all the three ingredients and mix them well in a bowl. Take a cotton ball and apply this mix to the tanned surfaces. Let it stay for about 10 minutes and then wash it off with cold water. Using this pack regularly immediately after sun exposure works wonders. As already mentioned, lemon is a great bleaching agent, and along with tomatoes and yogurt, it makes a great suntan remover. This face pack improves the skin tone, lightens dark spots and pigments. The tomato juice helps to shrink the open pores and also cut down the oil from the skin. Yogurt provides moisture and nourishes the skin. Take two tablespoon tomato pulp, one tablespoon lemon juice, and a tablespoon yogurt. Apply this paste on the face and wash away after half an hour. In the beginning, you might experience a little itching. But with regular application, the sensations may go. 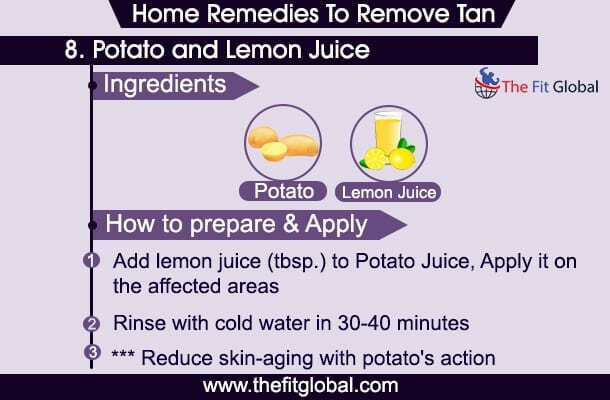 If you want to remove sun tan from the face, this is probably one of the best home remedies to remove tan. Vitamin C present in orange helps to improve the tone and texture of the skin and to clear out the skin blemishes. Oranges are also loaded with collagen which arrests the ageing process and tightens the skin. Yogurt moisturizes and bleaches the skin. Take a tablespoon of both orange juice and yogurt and apply evenly on the face. Let it stay for half an hour and then wash off with plain water. Your skin will feel soft and supple. The holy powder, turmeric makes this pack one of the best home remedies to remove tan. The pack gives out double action by bleaching as well as scrubbing. 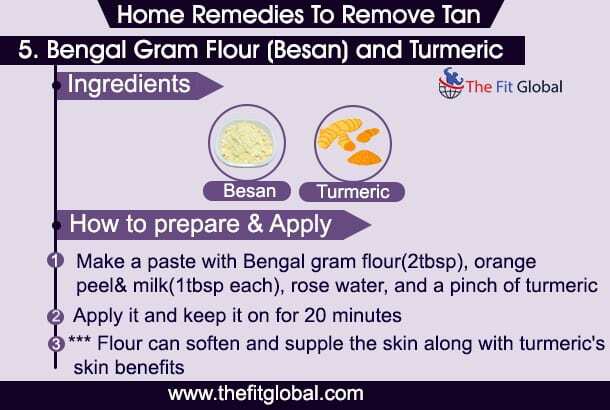 Turmeric gives a natural glow to the skin and reduces pigments whereas, Bengal gram flour acts as a scrub which exfoliates the skin and removes the dead skin layer. Both the ingredients of this pack effectively remove sun tan. To make this pack add two tablespoons of Bengal gram flour, a pinch of turmeric(1), a tablespoon of crushed orange peel, a tablespoon of milk and cool rose water. Apply this mixture on face and let it dry for at least 20 minutes. Sprinkle some water on the dried pack and then remove this pack by scrubbing the pack gently in anti-clockwise and clockwise direction. To remove the tan, you must use this pack once in 2 days. Oatmeal is an excellent skin exfoliator. It removes dead skin layer and blackheads. 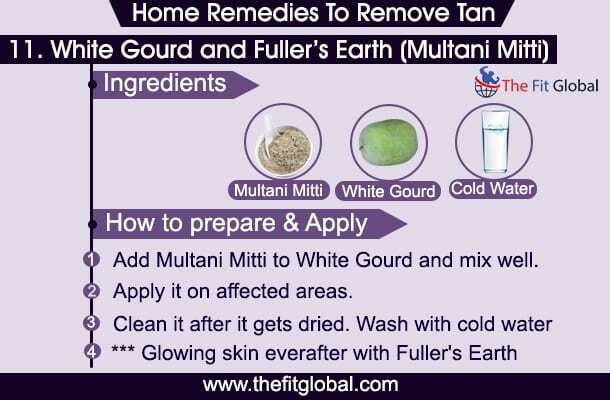 It is considered as a great sun tan remover. Buttermilk, as everyone knows, is loaded with benefits. It helps to soothe and moisturize the skin. It also heals blisters. To make this exfoliating face pack take two tablespoons of oatmeal and three tablespoons buttermilk. Massage this mix in a circular motion. You can apply this pack on face and body. Keep it for 15 to 20 minutes and then wash with cold water. The enzymes in papaya help to remove sun tan. The enzyme named papain has skin- lightening effects. It also helps to lighten blemishes(2) and scars. Honey, as everyone knows, is a great moisturizer and softener. Take half cup of ripe papaya pulp, add honey and mix them well. Apply on face and keep it for half an hour. Wash with water. Papaya for health and skin has excellent beneficial properties, not only by eating, but it also has some external applications. Potato is considered as one of the best remedies for removing sun tan. The vitamin helps to lighten the complexion and gives a healthy glow. It helps to remove blemishes, inflammation, and counter skin aging process. Extract the juice of a potato. Apply the mixture on the face and other areas. Keep it on the face for about 30 to 40 minutes. Lemon juice gives an extreme relief from skin problems, especially to treat freckles on the face, lemon juice stands on the top of the list. 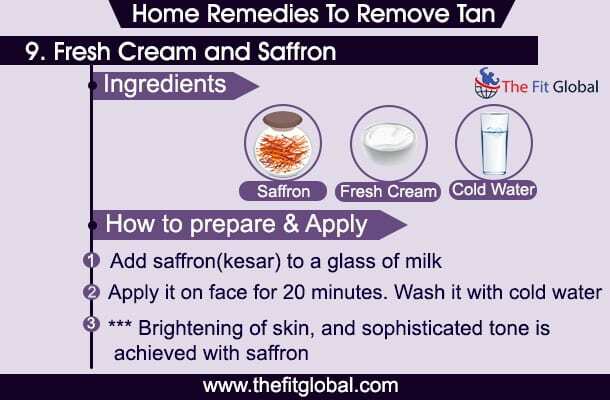 Since ages saffron has been considered as one of the best home remedies for sun tan. It has been of a great cosmetic value. It is used for skin brightening, tan removal, toning, removing pimples and acne. Blend some kesar strands with two tablespoons of milk. Leave it on the face for about 20 minutes. Strawberries are delicious and are loaded with tan removing properties. They lighten complexion, remove dark spots, freckles, and pigmentation. Milk moisturizes and nourishes the skin. It is considered as one of the best homemade face masks for removing sun tan. Crush four strawberries and add two tablespoon milk cream. Leave it for half an hour and then wash with cold water. 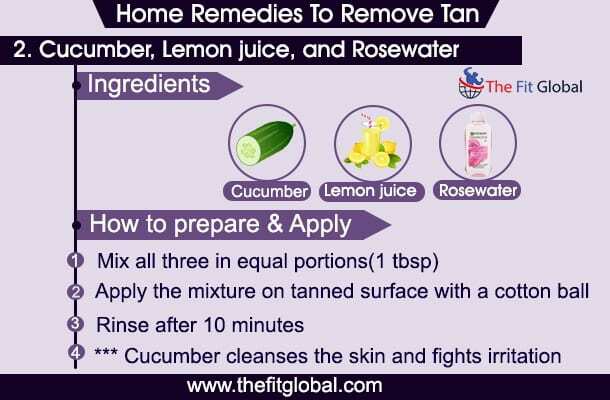 To get the best out of home remedies to remove tan, start with the basic treatment that is suggested to you at the initial search. After seeing the result, we can figure out how do they work on our particular skin. Take a white gourd and make a paste out of it. Add 2 spoons of fuller’s earth powder. Mix the paste well. Apply it on the affected areas; face neck, hands, back, neck, et al. Among all the homemade face masks, this remedy stands apart. All the ingredients have great cosmetic value. Milk powder moisturizes and nourishes the skin. It improves texture and tone of skin. Take two tablespoons of milk powder, one tablespoon of honey and some drops of almond oil. Mix well and apply evenly on face. In separate, health benefits shown by almond oil alone are enormous. It saves many aspects of our body like face, skin, hair, etc. Pineapple is loaded with enzymes that remove the dead skin cells from the tanned regions. Also, they are rich in Vitamin C and antioxidants which neutralize the effects of the free radicals. Pineapple is great for slowing down aging process and signs of aging like wrinkles, fine lines, and freckles. It lightens dark spots, sun tan, and pigmentation. Take two tablespoons of pineapple pulp. Add one tablespoon honey in it. Apply it all over the face and wash off with cold water after 3 to 5 minutes. The White flour helps in combating skin issues like uneven skin tone, dark spots, et al. 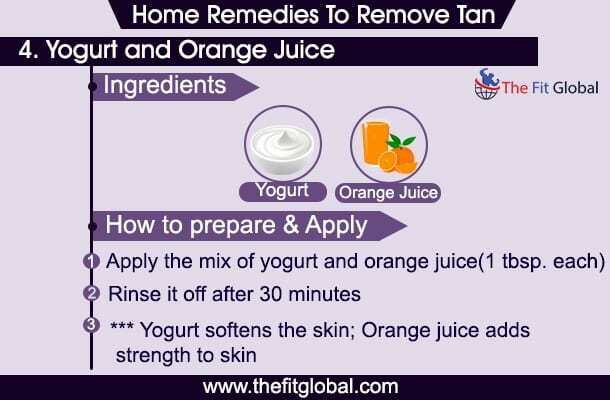 This is one of the most effective home remedies to remove tan. Considered as one of the best homemade face masks(3), this face mask is easiest to make. Take 2 tablespoon wheat flour. Add water. Make sure the paste is not very thick. 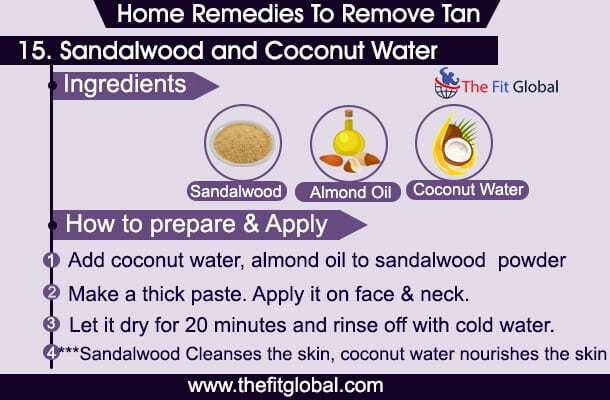 If you are wondering how to get rid of sun tan, try one of most amazing homemade face masks made of sandalwood and coconut water. The use of sandalwood has been extensive as a cosmetic product. It is a great cleanser which removes dead skin cells and other impurities. It soothes down the skin and removes blisters and blemishes. Sandalwood and lemon juice with rose water clear the browns spots on the skin. Take a tablespoon of sandalwood powder. Mix it with coconut water. Add some drops of almond oil. Make a paste of thick viscosity. Apply this paste n face as well as neck. Apart from all the amazing natural face packs, there are many other homemade face masks that remove sun tan from the face. The best part is that you can easily make these face packs at home. 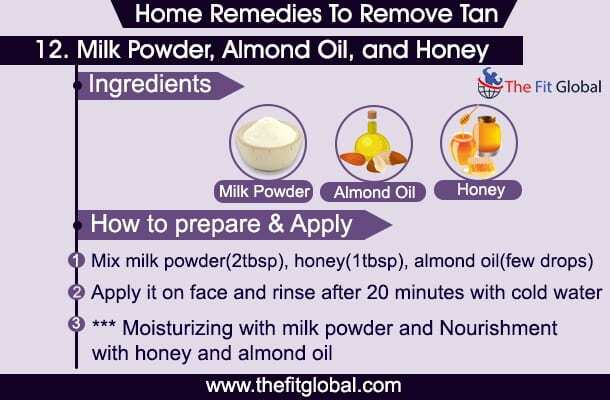 Other home remedies to remove tan include vinegar, baking soda scrub, rubbing papaya over tanned areas, fuller’s earth and aloe vera gel pack, cornmeal and lemon juice face scrub, turmeric and raw milk and many more. All you need to do is to explore your kitchen for many such ingredients helping skin’s health working as remedies for a sun tan. One important deviation from the topic required is the awareness of harmful effects of the sun on our skin. This is for knowing what all do we have to pay for if we are not conscious enough about our exposure under the sun. When the sun showers its rays on us, our skin is the part that suffers the most. As a major portion of our body is bare to the sun and hence, it suffers a lot. The ultraviolet rays (UVA and UVB) ejected by the sun cause problems ranging from less serious to extremely serious. Dark skin due to an excessive melanin production under the dermis. Thus, the areas exposed to the sun get darker and darker. These other problems that are risen due to sun’s hazardous rays show their parallel disaster along with suntan. The remedies we have brought today are effective and potential to resolve the above additional problems also. Hence, try natural remedies for yourself and I promise, you’ll always be with them for any natural treatment. 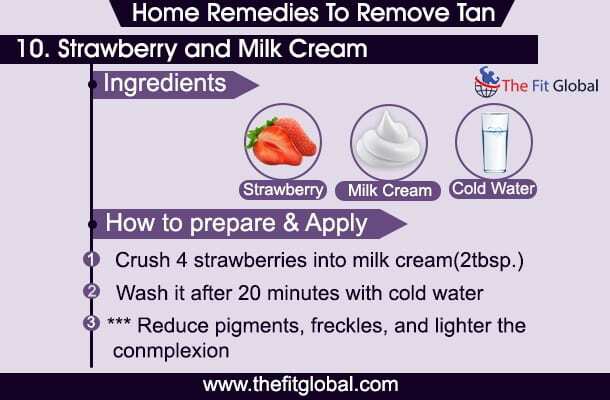 Here are 15 proven home remedies for tan removal presented together in a single picture to help you regain your glowing skin in no time!